With his near daily, and often times hourly, outrageous remarks dominating the news cycle in a rinse-and-repeat pattern of outrage followed by a refusal to budge, Donald Trump and his campaign of demagoguery have drowned out otherwise newsworthy political developments for over a year now. While Trump was making his latest outrageous statement at a rally in Florida Wednesday evening, NBC News released a very revealing — albeit rather apparent — poll finding that seems to have been underreported. 72 percent of registered Republican voters still hold doubts about the President’s citizenship, even as his second term in office enters its final months. 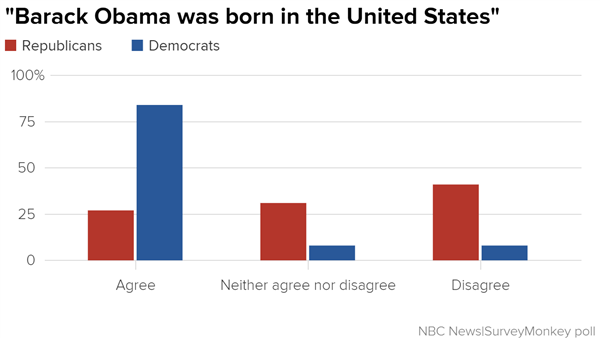 According to the NBC News|SurveyMonkey poll conducted in late June and early July of more than 1,700 registered voters, only 27 percent of Republicans agree with that Obama was born in the U.S. statement, while 41 percent disagree. Trading places: If the Democrats are now a coastal elite party and the GOP! Top 13 Things That You Wont Believe Are Legal! !